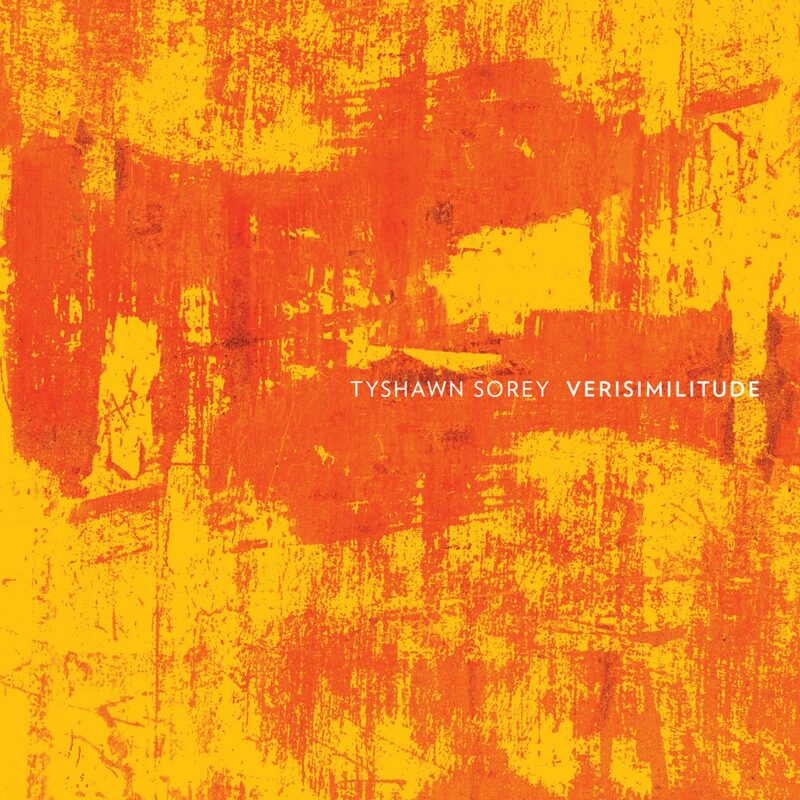 Verisimilitude is the latest in drummer/composer Tyshawn Sorey’s continuing effort to shatter the jazz piano trio tradition by extending the form to encompass the influence of the likes of Feldman, Debussy and Xenakis. One of the most in-demand drummers in improvised music – he has in recent years collaborated extensively with the likes of John Zorn, Vijay Iyer, Steve Lehman, Claire Chase, George Lewis, and Roscoe Mitchell, among myriad others – Sorey is also in the vanguard of artists working in that liminal space between spontaneous composition and notated music. The New Yorker calls Sorey “among the most formidable denizens of [that] in-between zone,” while The Wall Street Journal has called him “a composer of radical and seemingly boundless ideas.” Featuring Cory Smythe on piano and Chris Tordini on bass, the trio’s first release, Alloy (Pi 2014), was described as “shadowy and elegant” by The New York Times. His 2015 release, The Inner Spectrum of Variables, which also features the same group joined by a string trio, was called “devastatingly gorgeous” by The Chicago Reader and “a genuine masterwork” by Stereogum. The new work utilizes a wide array of percussion, along with judicious use of electronics to explore a wider textural soundscape. The result is a far-reaching and intensely beautiful work that daringly blurs the boundaries between composition and improvisation. It’s been a momentous last couple of years for Sorey. Straddling two distinct yet rapidly blurring worlds, his composed work “Josephine Baker: A Portrait,” which premiered at the 2016 Ojai Music Festival with a subsequent performance at Lincoln Center’s Mostly Mozart Festival, was named by The New York Times to their list of The Best Classical Music of 2016 and “one of the most important works of art yet to emerge from the era of Black Lives Matter.” He has also been commissioned to compose a song cycle celebrating that movement, which will premiere at Opera Philadelphia and Carnegie Hall in 2018. In the jazz world, he made his debut as a leader with his trio at The Village Vanguard, which The New York Times described as “gestural, and philosophical, and sometimes hard to get a fix on; it also sounds excellent in the close confines of the Vanguard.” The trio also performed at the 2016 Newport Jazz Festival, featuring new works commissioned by the Festival. Sorey was also seemingly everywhere at the much lauded 2017 Ojai Music Festival, curated by pianist Vijay Iyer, appearing either as drummer, percussionist, composer, or place of the recently retired Anthony Braxton. The pieces on Verisimilitude stem from the trio’s performances at The Village Vanguard (“Flowers for Prashant,” “Algid November,” “Contemplating Tranquility”) and The Newport Jazz Festival (“Cascade in Slow Motion,” “Obsidian”). The cohesion between Sorey, Smythe (International Contemporary Ensemble, Hilary Hahn), and Tordini (Claudia Quintet, Becca Stevens, Matt Mitchell) is uncanny, evidence of their extensive shared experience. Sorey affords his bandmates plenty of flexibility to interpreting the music, which Smythe describes as “a kind of supportive, exciting bond I feel when we arrive at a musical space we’ve already mapped together, and an even more exciting variant in the spaces we find together for the first time.” This group also does unfathomable things (for example, playing the score entirely backwards, or playing the score backwards by measure number) that are based on textual and/or verbal instructions by Sorey moments prior to hitting the stage. It’s a performance practice that Smythe believes is “a novel, perhaps intentionally disorienting path through the material, whose near impossibility spurs and necessitates invention. That said, Tyshawn seems to have no trouble with any of this. And he does it from memory. It shouldn’t be possible, but there you go… It’s Tyshawn.” The music on Verisimilitude unfolds like a dream, deliberately, but with swelling crescendos and unexpected eruptions. Perhaps the overall melancholic aura can be attributed to the passing in 2015 at the age of 42 of the filmmaker Prashant Bhargava, with whom Sorey worked closely on the Vijay Iyer-led music and film project Radhe Radhe: Rites of Holi, to which the piece “Flowers for Prashant” is dedicated.